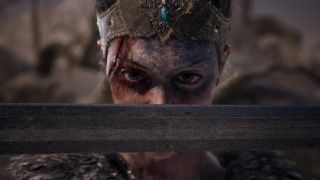 How Senua's Sacrifice changed the studio's fortunes and approach to making games. Ninja Theory's Hellblade was arguably a surprise success last year, selling over half a million copies on both PC and PS4 and getting positive notices from the likes of us. This Viking age-set hack-and-slash adventure found an interesting middle ground between big $60 game and indie game, helped by the fact that it looked and sounded amazing, and had a price point that made sense for the scope of experience on offer. Earlier this month, Ninja Theory won a staggering five BAFTAs for the game, and to chief creative director Tameem Antoniades, that level of acclaim obviously means a lot. "It's sort of a validation of the model we chose, which was to do something outside of the publisher model, taking all the risk ourselves, putting our own money into it. And then relying on our team. All of us had no real reason to believe that this would be successful, but everyone put everything into it." When I visited Ninja Theory in Cambridge in late 2014 to see Hellblade in a really early state, most of the staff were working on the now-defunct Disney Infinity. Antoniades was realistic in our conversations about the difficulty of working with big publishers as a mid-sized independent studio, and how that led to Hellblade, a game funded, published and owned by Ninja Theory itself. "Back when we started, the big publishers started to move away from consoles," says Antoniades when I speak to him at Rezzed. "They were abandoning consoles for mobile and free-to-play, and the publishers were investing in their own internal teams and not coming to studios like us. So we couldn't get signed, despite our history and track record. "We couldn't get signed, and when we did get signed, various projects quickly collapsed. So it felt like there was no place for us, and people would say to us, you can either do big triple-A or you can be small indie—there's nothing in between. We did have our backs against the wall, and things were looking dark, which is why we had to do something about it. Take a different path. I'm glad we did. I'm glad we were in the situation where we had to take a big chance." Ninja Theory has previously worked on great games like Enslaved and DmC, in collaboration with publishers. Cashflow is no longer an immediate concern for the studio, which is encouraging to hear. "For the first time in 18 years, we feel like we're now in the driving seat. That doesn't mean that we won't do work for hire and work with other publishers, because I think having a healthy mix of work-for-hire, publisher work and original work is better than going back to how we were, which was being a one-team studio. Things got very precarious after you'd finish a project." I ask Antoniades why he thinks Hellblade stood out at a time when it's hard for independent developers to get eyes on their games. "I think there are a few keys to that. One is your game has to be creatively different to what's out there. If you're doing a smaller version of a bigger game, no one will be interested. So you have to take a different path, which in our case was exploring mental health and psychosis. So you have to have something that's worth talking about. "But the second thing we did was we built up a following through our 30 development diaries, and just before release, we asked our supporters, the people who were following, to pre-order the game to help us. We were quite open about it—'we need your help, please pre-order the game'. And we used money from the pre-orders to launch a marketing campaign, so at least we had a chance. That's a good lesson to take forward. And those followers were our PR army. They were out there, spreading the word, and this is a game, if it's successful, it's because of the word-of-mouth power." "This year, I think we'll start showing some new stuff," Antoniades tells me. "We have 100 people...working on a mix of projects on different sizes and different themes. Some in VR, some in traditional. It's quite a good mix actually." I ask if the success of Hellblade means Antoniades feels any pressure to explore serious subjects in Ninja Theory's next game. "I think that's more down to my own personal interest. We've got other projects on the go, led by different team members who have their own personal slant on what they want to do, and they're not serious subjects, they are much more fun, traditional games if you like. "You can see it back from Heavenly Sword: I've been interested in the idea of the medium being used in a way that games like Ico and Another World on the Amiga and Prince of Persia. I like that kind of experience, the personal hero journey. And I'd like to explore more interesting subjects like that." For Antoniades' team and their next game, he plans to restrict the scale of the operation once again. "I think it was the severe lack of money and people that made this game innovate, that made the team innovate." I ask if the solutions they found in compensating for Hellblade's limits in team size and budget puts them in a good position for their next project. "Yes. So we can build on that, but we can find new challenges. The magic of games for me as I was growing up, or in this industry, is that certain developers—John Carmack, Peter Molyneux—certain teams and certain developers just seemed to create magic out of nowhere. "They were creating such amazing things. I'd like to be part of that culture." At launch, Hellblade generated a lot of discussion around permadeath. The markings on Senua's arm creep up the more she dies in the story, and the game suggests that 'all progress will be lost' once the markings reach her head. The game never deletes your save, though, but just the idea of it provoked a lot of conversation—some interesting, some frustrating as you might expect. Either way, I'm pretty certain it was good for the game's profile. "Looking back, it probably was," Antoniades says. "It did blow up a little on Twitter. We watched with some amusement at the conversations that went around it. The outrage, the debate. But what I'd like to say about that, is it wasn't a gimmick. It was in service of the story, which is why we did it. Some people say we lied—if you look at that statement we put out about the game, about the permadeath, it's not a lie. It's actually true. But our interpretation of it is what counts, is what causes anxiety. And that was a very deliberate move, because the whole game is about our interpretation of reality and how we undermine our own belief systems and how we suffer by believing things that we are absolutely certain works in one way, and it turns out it's another thing." Antoniades tells me that he was inspired by the movie Fargo for this idea, which famously opens with the message 'This is a true story' despite being an entirely fictional tale.